Equities – A Bottom or a Value? - Epoch Investment Partners, Inc.
Equities – A Bottom or a Value? In the equity markets, calling a bottom is different than seeing value. The former is a judgment about price and time whereas the latter is a judgment about price only. After the second worst peak-to-trough decline in the stock market’s history (so far at least), values are appearing, and some pundits are even speculating that this may be a generational buying point. At Epoch, we continue to maintain a more conservative outlook than some of our more optimistic colleagues, but we certainly believe values exist. Figure 1 illustrates the relationship between the U.S. stock market and GDP in nominal terms. Going back to WWII, one sees that the value of the market has averaged about 66% of GDP. At rock bottom, this percentage fell to around 40% in the late 1970’s and early 1980’s when interest rates were two to three times higher than current levels; hence, the present value of financial assets were lower than they would have been were interest rates comparable to those we see today. At the moment, the value of the stock market is about 70% of GDP, which seems to indicate value. But the most important difference between the present bear market and those of the past is that, today, you are paid to play. How so? Look at Figure 2. Here we show the relationship between bond yields and stock yields. By dividing the bond yield by the present equity yield (E/P), we see that bond yields are currently half that of equities: the largest gap in 30 years. It is rare to see such a tailwind for equities in comparison to bonds and this, we suspect, is why some are seeing this moment as a generational buying point. But what if there is no “E” (in the earnings yield ratio), or at least less of it than what is forecasted? We would argue that the “E” is indeed too high in the Factset Database we used, so let us lower the number by 20% for 2009. Furthermore, let us look at that number ex- financials as well for, as we all know, accounting methodology in the financial sector is questionable at best. Even with a reduced “E”, the earnings yield still remains over 225 basis points greater than the bond yield. In addition, the earnings yield has a growth rate associated with it over time, something the bond yield cannot boast. If inflation does reassert itself as a result of the government stimulus generated by monetary and fiscal policy, equities will ultimately protect the investor while long term bonds will ultimately result in an erosion of purchasing power. And, as long as there are productivity gains in the economy, equities will capture them whereas bonds will not. If productivity remains at a 2% level, equity returns will double in 36 years assuming no change in capitalization rates. Not great, but certainly better than fixed income returns. It is worth saying a few words on the market’s present volatility. Recently, the VIX1 hit 81.2: a record level. What does this explosion in volatility portend? In our view, the combination of the substantial peak-to-trough equity market decline plus recent volatility is easily a three standard deviation event. But just what, you may ask, is a three standard deviation event? Over the long history of market returns (1926-2007 for the S&P 500), the expected annual return for equities is approximately 10%. However, if one wanted to place a confidence interval around that expectation that would capture 95% of the possibilities, the range would be 10% plus or minus 35 percentage points. In other words, 10% may be the mean expectation but the range for a single year would be -25% to +45%. Given the decline of the past twelve months, we have had a three standard deviation event in terms of the result falling outside of the aforementioned range. At the same time, we have witnessed record volatility. One of the potential explanations for this volatility is a phenomenon physicists call “Brownian Motion”, which describes what occurs when a window is opened and rush of air disturbs dust particles. Simply put, the particles swirl about in a manner that reflects that each particle’s motion is independent from that of other particles, yet all movement is derived from the common source of the open window. Many years ago, a finance paper authored by the physicist M.F.M. Osborne recognized the similarities between Brownian Motion and price changes within the stock market: an idea that later became the heart of the so-called “random walk hypothesis” for stock prices. According to Osborne’s findings, stock prices moved randomly (i.e., independently of one another) and, depending on the force generating the movement, with potentially a great deal of velocity. Today, we can certainly see evidence of this Brownian Motion in the erratic behavior of the stock market. The pinprick that burst the housing bubble was caused by the collapse of the sub prime market, which, in turn, was turbo-charged by financial leverage, opaque structures, and derivatives. Taken together, these forces blew open the financial economy’s window, disrupting the stock market and causing equity prices to surge in volatility. As the window closes, however, volatility should return to normal over the next year. The “vol” as measured by the VIX will stabilize, barring some other extraordinary economic event. This eventual stabilization may not seem likely now, but it will happen; and trusting in this eventuality is an important part of discerning value. Irrefutable evidence that the gridlock in the credit markets has broken. The credit gridlock is like a 108˚ fever: if it does not break, the patient (i.e. the economy) will die. Thus, it was imperative for the TED spread to shrink from its level of 450 basis points in early October to less than 200. Swap premiums need to decline and LIBOR needs to fall as well. A better definition of solvency risk. How large are the write-offs from housing related debt instruments going to be? The IMF just raised the number from $950 billion to $1.4 trillion, the same number as Bridgewater’s. Nouriel Roubini, the most articulate and prescient economist on this subject, has estimated a number north of $2 trillion. Write-offs to date are above $700 billion, so we are probably half way there. Recently enacted TARP legislation will help here as well. A more reliable estimate of the length and depth of the global recession. We are far from having that knowledge now. The next several months will contain horrific data points with respect to real economic growth measures. But, once the bottom of the stock market becomes visible, the bottom will have already occurred. As Buffet said, when the robins arrive, you have already missed the Spring. With unemployment likely to reach 8%, it is far too soon to be bet on either the true duration or severity of the recession. As such, the winning strategy for equity investors will be to “look across the valley,” an idea that will dominate strategist reports in 2009. As for now, it is just too soon to speculate upon the downturn’s duration. At the moment, this vision is more faith based than evidenced based but it will be a talked about subject next year. We suggest a specific investment strategy – the purchase of cash generating assets. Indeed, it is the only strategy that will work. Accounting-based investment concepts that use price to book and price to earnings as their primary investment metrics have lost all credibility. No one allocates real money this way. Bear Stearns went broke while purporting to have a $60 book value. Then Fannie and Freddie, Country Wide, WaMu, and Wachovia succumbed under similar conditions. How about National City and other similar firms? What more does one need to confirm, once and for all, that this methodology does not work? No corporation allocates capital based on P/B and P/E criteria, nor does private equity. Capital allocation is always about the identification of cash generating assets and the potential available to management for shareholder value creation from the proper application of the related free cash flow among cash dividends, share repurchases, debt reductions, internal reinvestment projects, and acquisitions. The equity strategies that will succeed in the next five years will be based on free cash flow methodologies, not accounting models. Dividend products will be popular in a world of slow growth. American equities will do well because they are cheap when viewed from the perspective of the Canadian Dollar, the Pound, and the Euro. Global Small Cap should also perform well, given the huge decline this asset class has experienced in 2008. Here, the benefit of size (small) and the effect of globalization (the Law of Comparative Advantage) will prove winning criteria when the world economy recovers. 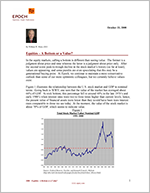 The following scenario shows the derivation of equity return expectations. There are only three drivers in this scenario: dividends, earnings, and P/E ratios. Figure 3 shows the decade by decade equity returns for over 80 years. It is important to note that we have never had two consecutive decades at zero. As a matter of fact, we will be close to zero for the 10 years through 2008, barring a surge in equity values in the fourth quarter. As for the drivers of equity returns, let’s start with dividends. The cash dividend yield for the S&P 500 is now 3.2%. Over many years, it can be shown that earnings track nominal GDP (Figure 4). If nominal GDP is around 6% (3% real and 3% for inflation), we have a 9%+ return assumption for equities, excluding the influence of the other driver, capitalization rates or P/E ratios. Interest rates and P/E ratios are inversely correlated, so much so that, for the past 25 years, the correlation coefficient has been -0.8. That means that nearly two thirds of the change in P/E ratios can be explained by changes in interest rates. If interest rates go up in the future from the current levels of 4%, then P/E ratios will likely go down. The point here is that future returns are likely to range between 7 and 9% over a multi-year period. This means that dividends will really matter, as will management’s talent for capital allocation. It also means those investment managers reliant on price-to-book models and price-to-earnings ratios will continue to suffer in relative performance versus a finance-based, free cash flow methodology. The market may or may not be reaching a bottom, but surely it is approaching fair value. There are too many companies generating free cash flow combined with valuations that are attractive. The valuations are of necessity “faith based” at this point, but if we wait for “evidence based” valuations, we will have already missed the Spring as suggested by Warren Buffet. 1A measure of expected stock market volatility (the standard deviation) over the next 30 calendar days.